An Adelie Penguin on top of an iceberg at sunset. 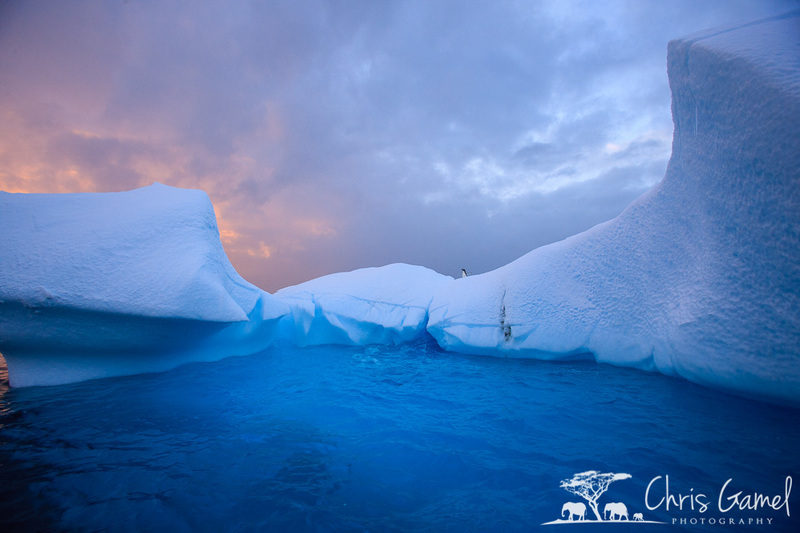 A small iceberg at sunset in Antarctica. Mountains reflecting on the water at the Lemaire Channel, Antarctica. Clouds over the Lemaire Channel, Antarctica. A tunnel through the ice at Cievra Cove, Antarctica. An Adelie Penguins riding on top of an iceberg at Cievra Cove, Antarctica. Thousands of Gentoo Penguins migrating to establish a breeding colony at Point Charcot, Antarctica. A Gentoo Penguin calling at Arctowski, Antarctica. 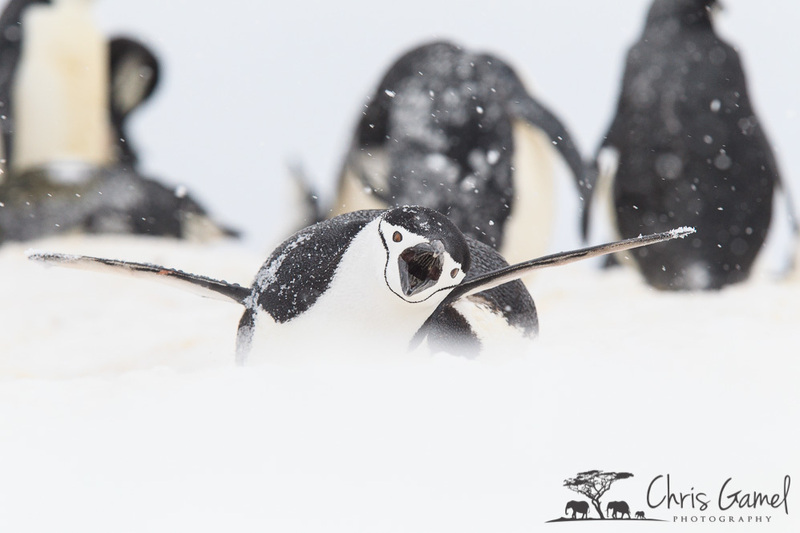 A chinstrap Penguin spreading its wings and calling during a snowstorm at Half Moon Island, Antarctica. Two Gentoo Penguins fighting in the snow at Half Moon Island, Antarctica. Chinstrap Penguin Lying the the Snow. A Chinstrap Penguin lying in the snow during a snow storm at Half Moon Island, Antarctica. A Chinstrap Penguin daning on the snow at Hydrurga Rocks, Antarctica. A Chinstrap Penguin carefully walking down a steep hill of ice at Hydrurga Rocks, Antarctica. 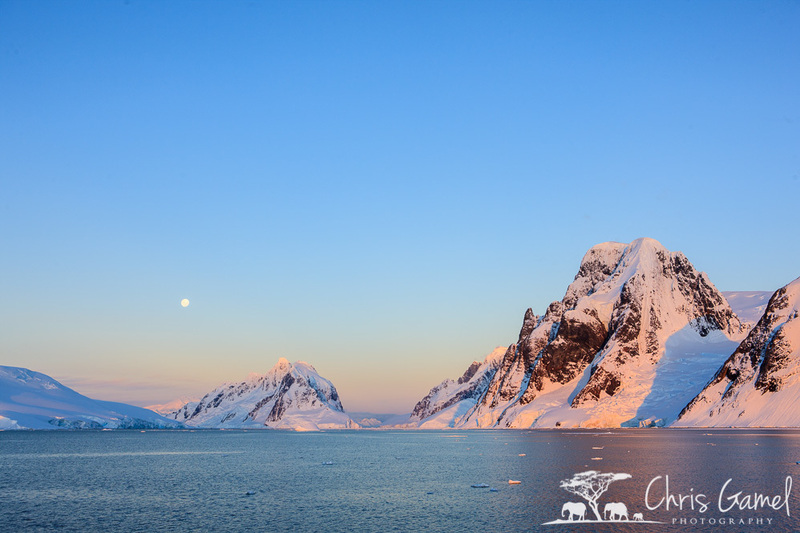 A Gentoo Penguin standing alone at sunset at Petermann Island, Antarctica. Adelie Penguins watching the full moon at Petermann Island, Antarctica. An Adelie Penguin with an egg on the nest at Petermann Island, Antarctica. Adelie Penguins mating at Patermann Island, Antarctica. Full moon rising at Peterman Island, Antarctica. Iceberg reflection at Andvord Bay, Antarctica. A rare view of the underside of an iceberg at Andvord Bay, Antarctica. Closeup of icicles on an iceberg at Andvord bay, Antarctica. Not all ice is white. 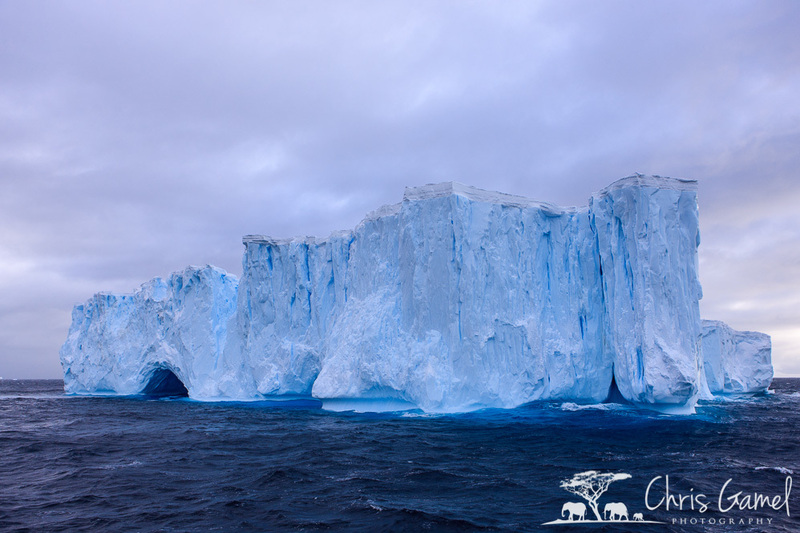 This iceberg had was a distinct shade of blue at Andvord Bay, Antarctica. This giant tabular iceberg, photographed in Antarctic Sound, was almost a mile across. A flock of Blue-eyed Cormorants flying through the icebergs at Point Charcot, Antarctica. Gentoo Penguins on an iceberg at Andvord bay, Antarctica. Gentoo Penguins walking through a snowstorm at Cuverville Island, Antarctica. A Gentoo Penguin breeding colony at Cuverville Island, Antarctica. Gentoo Penguin jumping to the water at Cuverville Island, Antarctica. A male Gentoo Penguin carrying a rock to the nest at Port Lockroy, Antarctica. An Adelie Penguin jumping onto the ice at Brown Bluff, Antarctica. The ship "Polar Pioneer" docked in the ice at Port Lockroy, Antarctica. A crabeater seal resting on the ice at Hydrurga Rocks, Antarctica. A Weddell seal resting on the ice at Brown Bluff, Antarctica.